What would afternoon tea recipes be without teacakes, cucumber sandwiches and scones? Three easy ideas to enjoy a British tea time! A cup of afternoon tea in England conjures up many evocative memories: teacakes at a friend’s house with strong Earl Grey; toast with dripping honey, washed down with piping hot Darjeeling, and scones and jam in a quaint little English tea room. 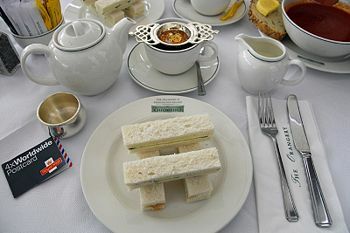 But the most English tradition of all is the afternoon tea. It is a light meal typically eaten between 3pm and 5pm. Sadly this wonderful tradition is dying out – people are too busy, life is too fast and no one has time to sit down to share innocent pleasures with friends. Let’s rejuvenate the idea - why not invite your friends to a British afternoon tea? Here are a selection of three easy-to-make afternoon tea recipes to get you started, with more ideas at the end of this article! Toasted Teacakes - A light, sweet, yeast-based bun containing dried fruits such as currants, sultanas or peel. Cucumber Sandwiches - This traditional recipe is composed of paper-thin slices of cucumber placed between two thin slices of crustless, lightly buttered white bread. 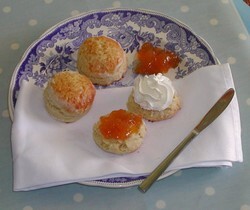 Scones - British scones are often lightly sweetened, but may also be savoury. In the U.S., scones are drier, larger and typically sweet. A teacake or tea cake is a kind of bread or cake. The name is commonly used for whatever bread or cake is traditionally served for afternoon tea within a region, but can be applied loosely to any kind of cake that is sturdy enough to be picked up with the fingers. Step 1: Preheat the oven to 150 degrees. Step 2: Sieve the salt and flour and rub into the butter until it is like breadcrumbs. Step 3: Mix in the dried fruit and sugar. Step 4: Mix the water and milk, then add the egg and combine with the dry ingredients. Step 5: When it resembles dough, split into eight round balls and gently flatten them into the traditional teacake shape. Step 6: Place on a greased baking tray and bake for half an hour at 150 degrees. Step 7: Remove from the oven, cool on a cooling rack. Step 8: Split them in half and serve dripping with butter and jam or honey – accompanied by a hot cup of Chinese tea for a perfect afternoon tea treat. The traditional cucumber sandwich is composed of paper-thin slices of cucumber placed between two thin slices of crustless, lightly buttered white bread. Cucumber sandwiches contain little protein and so are generally not considered sustaining enough to take a place at a full meal. This is deliberate as cucumber sandwiches have historically been associated with the Victorian era upper classes of the Great Britain, whose members were largely at leisure and who, therefore, could afford to consume foods with little nutritive value. Step 1: Spread the bread with a thin layer of butter, and then cut off the crusts. Step2: Thinly slice the cucumber and fill the sandwich with a single layer of crunchy cucumber. Step 3: Put the top on and cut into neat triangles. Serve garnished with long whorls of shaved cucumber. The scone is of Scottish origin. A small quickbread made of wheat, barley or oatmeal, usually with baking powder as a leavening agent. British scones are often lightly sweetened, but may also be savoury. In the U.S., scones are drier, larger and typically sweet. Step 1: Preheat the oven to 220 Fahrenheit. Step2: Sieve the flour into a bowl and add the salt, then lightly rub in the butter until the mixture resembles breadcrumbs. Step 3: Mix in the caster sugar. Step 4: In a separate jug, mix the egg and milk together and pour it gently into the dry mixture, stirring with a palette knife. Step 5: Use your hands to finish it off into a soft, non-sticky consistency – add extra flour or milk sparingly, if needed. Step 6: When it leaves the bowl’s sides clean, roll out on a floury surface to no less than an inch thick. Step 7: Use a round cutter and cut circles out, being careful not to twist the dough as you cut. Step 8: Place on a lightly oiled baking sheet and bake at 220 Fahrenheit for 10-12 minutes. Step 9: Take out and cool slightly on a rack. Step 10: Serve with clotted cream and jam. … the list of afternoon tea recipes is endless but what remains constant is the tradition and the good company!